It's the last Wii Update of the year! Will Nintendo make it count, or end the year with a whimper? Let's see what two new WiiWare and one new VC titles have to say. Representing the final two WiiWare titles of the year we have a Nintendo first-party WiiWare game called Maboshi's Arcade (800 points), featuring three distinct game modes - Circle, Square, and Stick - taking place simultaneously across three windows, tasking 1-3 players to earn a million points. It features Mii characters, shareable replays, and the ability to download a version of the game to your DS. I've no idea what gameplay is like, but it's certainly got features covered. Also on WiiWare this final week is Cue Sports - Pool Revolution from Hudson (500 points) , a pool game for 1-4 players featuring online multiplayer via the Nintendo Wi-Fi connection. While the pool game part is lovely, the online play is sure to grab the attention of virtual stick jockeys everywhere. 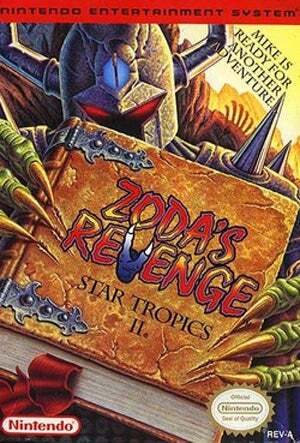 Last but not least we have this week's solo Virtual Console title, Zoda's Revenge: StarTropics II for the NES (500 points). The sequel to the original Star Tropics has Mike Jones again facing off against Zoda, with new weapons aiding him during his travels, which now encompass time and space. This was the next to last licensed game released for the NES, with only Wario's Woods coming after. Now you know! It really isn't a bad lineup this week, with two WiiWare games that offer something more than just shovelware, and a truly classic NES title that you generally won't find on a compilation anyware. A lovely ending to a lovely year. Dec. 29, 2008 - Champagne? Check. Confetti? Got it. But you're not fully prepared for New Year's revelry unless your Nintendo game library is stocked with games to please everyone under the sun. As always, the Wii™ Shop Channel is open 24 hours a day for your downloading pleasure. The final slate of new game offerings for 2008 includes a couple of wild multiplayer titles on WiiWare™, plus an enthralling sci-fi title for the Virtual Console™. Load up and enjoy! Maboshi's Arcade™ (Nintendo, 1-3 players, Rated E for Everyone, 800 Wii Points): Featuring three distinct modes and simultaneous play across three game windows, the constantly changing environment of Maboshi's Arcade creates an atmosphere unlike any other. Each of the modes is based on one of three familiar shapes (circle, stick and square) and offers the same goal: score a million points. Use the intuitive controls to bash enemies in Circle mode, weave your way through Stick mode or burn a path around obstacles in Square mode-all while dealing with power-up items and keeping watch on which effects the other game windows may have on your own. Also featuring Mii™ characters, action replays that you can send to your Wii™ Friends via WiiConnect24™, and the ability to download a version to a Nintendo DS™, you may never want to leave this arcade. Cue Sports – Pool Revolution (Hudson Entertainment, 1-4 players, Rated E for Everyone, 500 Wii Points): Grab your Wii Remote™ controller and take a shot at this virtual billiard game. Enjoy match-ups, playing classic favorites such as 9 Ball, 8 Ball, Rotation and Snooker, as well as walk-through trick shots in Puzzle mode. Connect to Nintendo® Wi-Fi Connection (Nintendo WFC) to go head-to-head with your friends, or even hustle opponents across the world in Nintendo WFC match-ups. This game offers two types of controls, allowing you to virtually strike the cue ball with your Wii Remote controller or use the buttons to adjust the strength of your shot and then strike. Hone your skills in Practice mode, learning all the cool techniques you need to be a true hustler. Use the edit feature to create your own challenge and nail the trick shot you've always dreamed of sinking. Pull off an amazing shot and show everyone who's the biggest shark in the pool. Zoda's Revenge™: StarTropics II™ (NES™, 1 player, Rated E for Everyone-Mild Cartoon Violence, 500 Wii Points): Take on the role of Mike Jones, intrepid hero of the StarTropics universe, and once again battle the evil alien Zoda to control the fate of the Argonian people. In this journey, the island hopping of Mike's original adventure gives way to traveling through time and visiting locations around the world. And you never know what famous historical figures may appear along the way, giving Mike helpful advice or useful items. Luckily, Mike also has a wider range of weapons and improved play control on his side, so he may yet stand a chance against Zoda. Can you help Mike stand the test of time and save the world again?